The feature walls at the entrance to this corporate office were faded grey and stained due to exposure to water and sun and spoiling the appearance of the building. The client asked us to restore the slate back to it’s beautiful dark colour and seal the tiles. This made a significant difference to the appearance of the building. Slate is a beautiful natural stone and black slate especially, can add a glamorous rich look on walls and floors. However, to make sure your black slate does not fade or stain, you need to seal it. 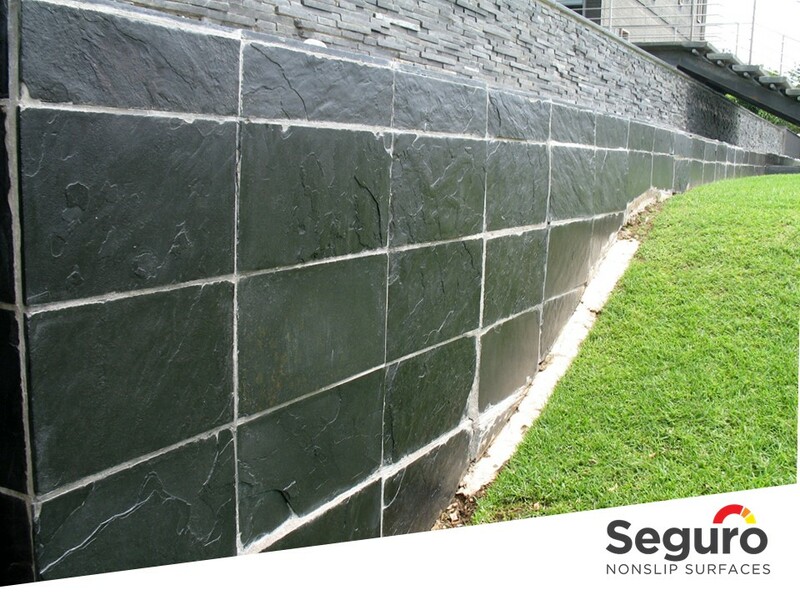 Seguro Nonslip Surfaces uses special sealers that minimize the risk of slips and falls after the tiles have been sealed. Leaving the tiles attractive and safe to walk on. The sealers we use have very low slip properties, minimizing the risk of slips and falls while sealing and protecting natural stone, cement and clay tiles. Remember sealers need to be re-applied every couple of years to continue protecting your tiles. View this video to compare before and after images.